If you are looking for a completely natural way to keep unwanted visitors from entering your garden, a security hedge is exactly what you need. Even the most experienced burglar will think twice when he comes across a dense, tall hedge with a set of sharp thorns. Luckily, buying a security hedge that will ward off uninvited people or animals does not necessarily mean that you have to settle for a hedge with an unattractive appearance. Several hedge plants that lend themselves for security hedging will look stunning during their respective flowering seasons, while others have beautiful leaves or strikingly coloured fruits. Anyone feeling particularly creative can even grow a mixed security hedge that will keep intruders out while adding ornamental value to your garden. On the surface, the purpose of a security hedge may appear similar to that of a privacy hedge. However, there are some significant differences between hedge plants that are well-suited for security hedging and species that make great privacy hedges. 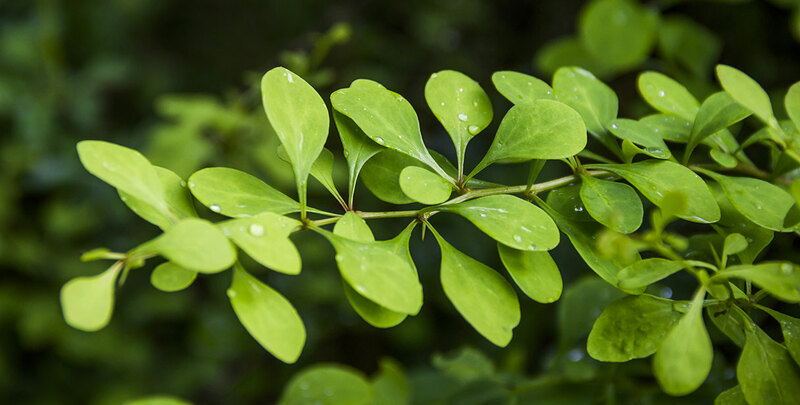 It is beneficial to both types of hedges if you use plants that have a fairly dense, compact growth habit. But though it is almost essential to use evergreen hedging plants in order to keep the prying glances of curious passers-by away from your garden, the branches of deciduous plants suitable for security hedging will stay thorny even after their leaves have fallen off. In fact, some of the most popular species for security hedging, such as the hawthorn, the blackthorn and Japanese barberry, are all deciduous plants. The height of your hedge is another important difference between privacy hedges and security hedges. In order to keep people from looking into your garden and through your windows, your hedge should at least reach to eye level. Of course, a security hedge also requires a certain height, because its thorns would not be very useful if a burglar could simply jump over your hedge, but if your security hedge is about 1.50 metres tall, it will still do the trick. A somewhat smaller hedge has the additional benefit that it will not block the sunlight from lighting up your living room. Plants with spiny branches are also often used by birds as nesting places, as the thorns will strongly discourage predators from attacking the nests. Therefore, some security hedges also serve as an excellent wildlife hedge. Barberries, both the evergreen berberis frikartii and the deciduous Japanese barberry, are remarkable security hedges in that they are frequently planted under windows instead of around gardens. 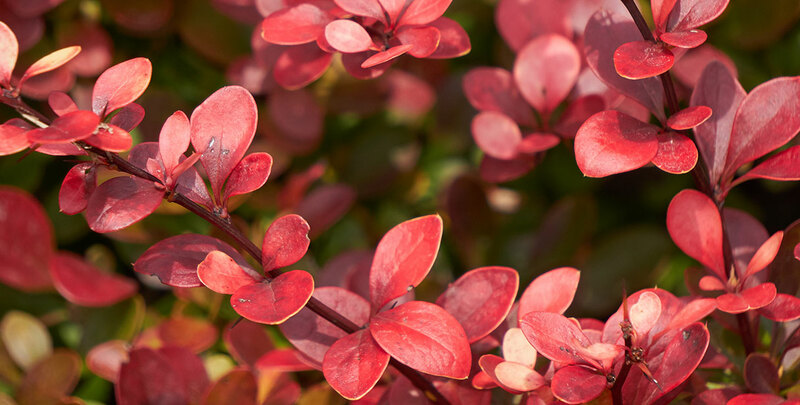 They can be used perfectly as a prickly garden barrier, but when planted underneath a window, a barberry hedge can scare off intruders – both animal and human – even if they manage to make their way across your garden. An extra security measure, so to speak. Traditionally, security hedges appear in the countryside in order to protect whatever is grown on the farmlands that they enclose and they are still highly popular for this purpose to this day. Especially blackthorn and hawthorn are considered the classic native hedging plants of the British countryside. While thorns are very effective means of keeping anyone who has no business being there out of your garden, they also make pruning security hedges a difficult and potentially painful experience. Luckily, most of the aforementioned species do not necessarily need to be trimmed. It is certainly possible to cut back your hawthorn hedge, for instance, if you wear gloves and possibly other protective clothing, but if you decide to let the plants grow, the wild look of the species will enhance the natural look of your garden. With that in mind, it is beneficial for most plants to prune them directly after flowering and to remove dead branches in order to give your security hedge a healthy appearance. Japanese barberry needs to be pruned a bit more frequently. Watch out for bird’s nests when you cut your security hedge though. There is a security hedge for just about any garden. Especially hawthorn and blackthorn can deal with a large variety of soils, but generally, these thorny species will feel at home in any well-drained soil. Even if your garden is in a position that is commonly considered difficult, there is a security hedge plant available for you. Hawthorn and blackthorn can deal with wetter soils than the average hedging species and rosa rugosa can even cope with coastal sites. Please pay attention to where you choose to plant your security hedge, as some varieties – some barberry types in particular – do not like shady positions. Naturally, if you want your hedge to also flower profusely, a sunny position is beneficial. 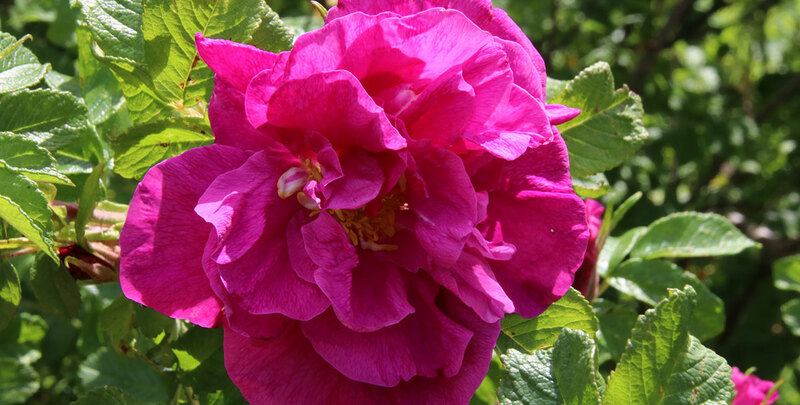 Rosa rugosa lends itself perfectly for a flowering security hedge.